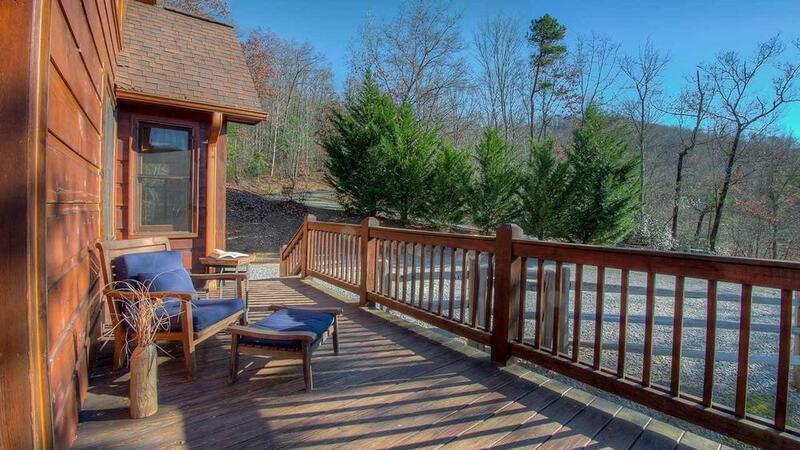 Buckhead Hideaway offers the perfect, peaceful escape from the city — while situated in a lovely, secluded setting, it's only three miles from downtown Blue Ridge. 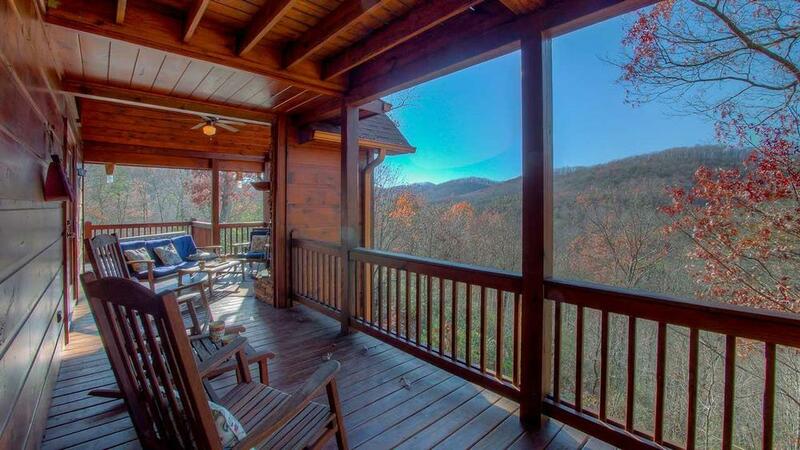 This Georgia mountain cabin rental features beautiful hilltop views that turn from lush green leaves to striking fall foliage, along with spectacular sunsets. This warm and welcoming home, featuring an all-wood interior and exterior, is bathed in light with large windows along the vaulted ceilings. 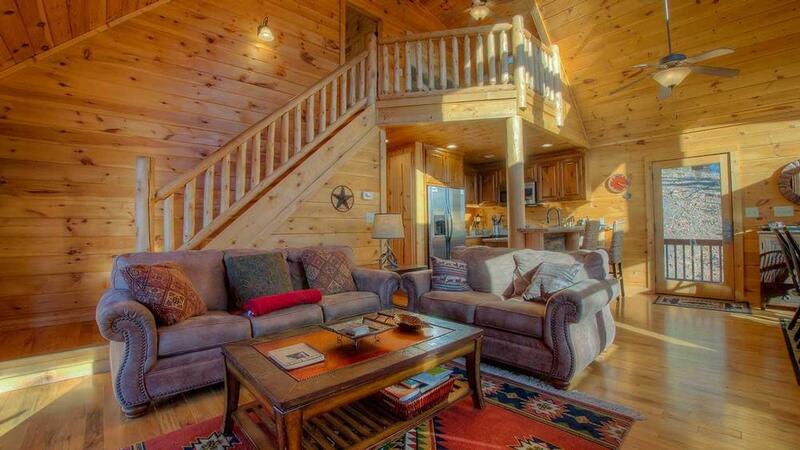 The stylish decor reflects an upscale cabin theme, where every detail has been considered to make you feel comfortable. Original art highlighting the beauty of areas like Blue Ridge adorns the walls. You and your guests will make the most of the cabin's outdoor space, with three decks to take in the spectacular sights. 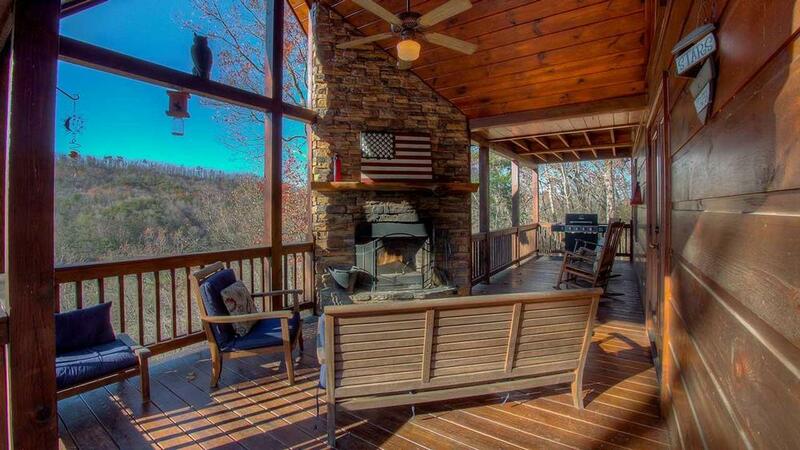 From enjoying your morning coffee out on a rocking chair, watching the sunrise, to enjoying the warmth of the outdoor fireplace or the soothing hot tub in the evening, you'll likely spend most of your day out here! You will be constantly amazed by the views before you — you may even see deer grazing nearby in the morning or near dusk. On a chilly winter afternoon, curl up with a book on one of the leather sofas in the den, warmed by the fire and a cup of hot chocolate. 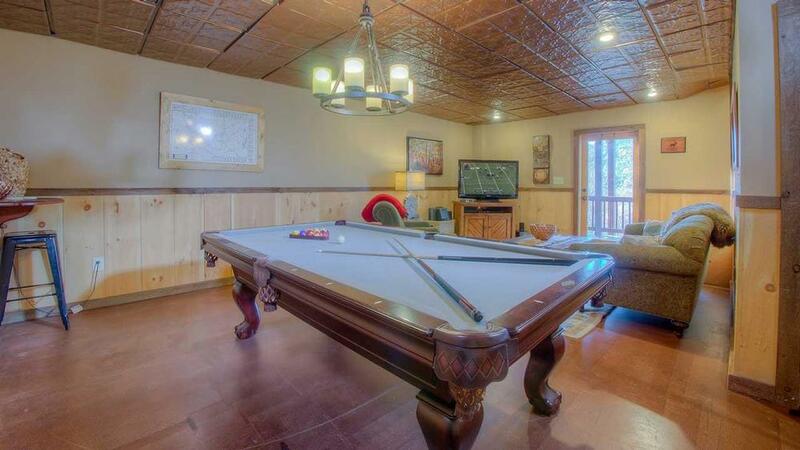 Or head down to the game room to shoot some pool, play darts or games. In the evening, open a bottle of wine and make a hearty pasta dish in the open kitchen or grill some steaks out on the deck's gas grill. When your feast is ready, enjoy it together in the cozy dining room. 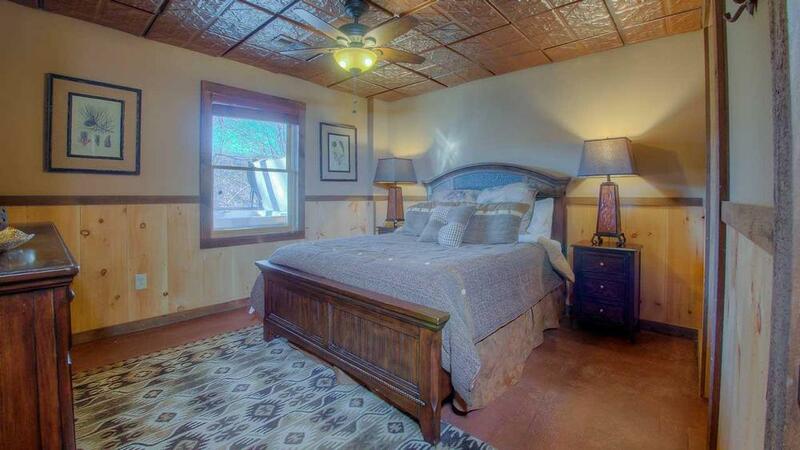 After a nice, relaxing evening, retire to either the king master suite upstairs or the king bedroom on the main floor. There's also a queen in the downstairs bedroom. Snuggle up under charming quilts for a deep, restful sleep. The atmosphere at Buckhead Hideaway was designed for comfort, rest and relaxation. 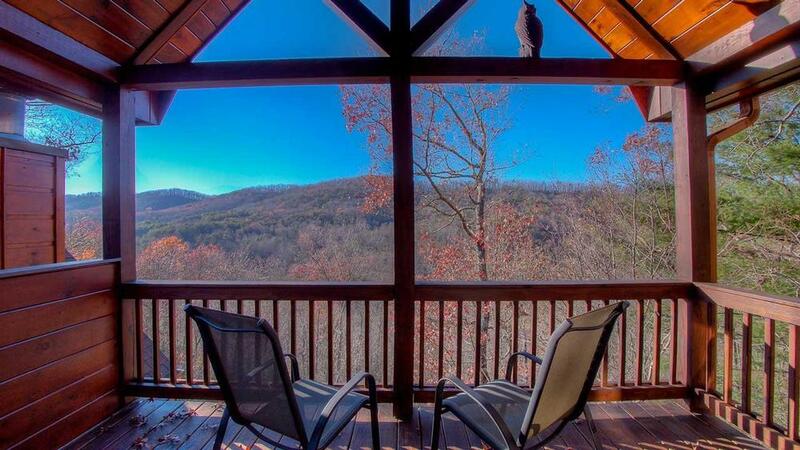 This secluded retreat will help you feel a million miles away from it all, and inspired by the beauty of nature. From the moment you wake up to the moment you go to sleep, every day here is about enjoying each moment, enjoying each other's company and enjoying the breathtaking sights surrounding you. 03/19 - We enjoyed how organized and clean the cabin was upon arrival. You have everything you need and more to make the stay warm and welcoming. 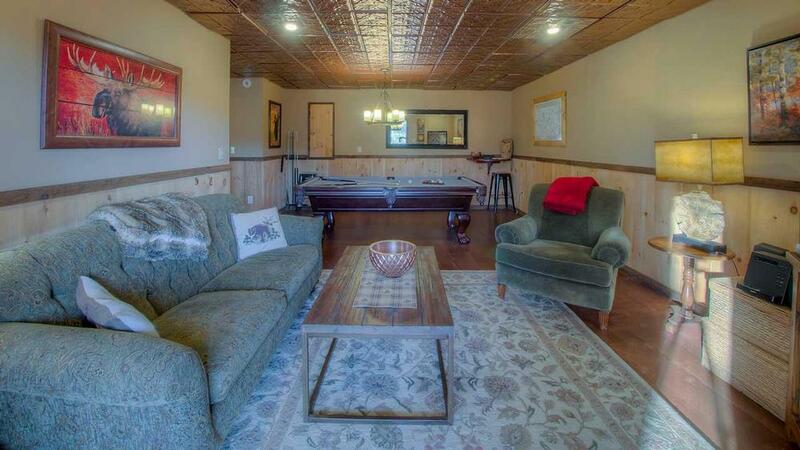 We enjoyed all the amenities of the cabin from the pool table, hot tub, and the common areas. The company is great, they are welcoming and very detailed with helping you make your stay a great one. 03/19 - The home was very spacious and adequately stocked with linen and kitchen utensils. Very customer service oriented. We loved our first impression with Escape to Blue Ridge personnel. We will visit again, soon!! 11/18 - Plenty of cookware, Christmas decorations were a great touch since we were there for Thanksgiving. I was able to see 2 cabins since other family members rented one too and both were great! Neat and clean and the company was very helpful with their emails. 11/18 - Loved the bedrooms. 11/18 - The very top item was cleanliness; but the view was equally as wonderful. We enjoyed the seclusion and all amenities we needed were there. This is our second time renting through your company and we have been very pleased so far. 11/18 - Cozy, comfortable and clean. 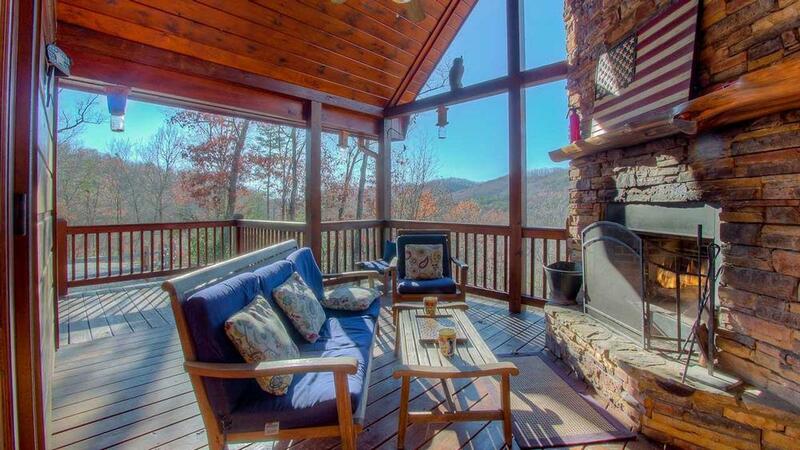 Our favorite spot was on the deck enjoying the outdoor fireplace and mountain views. Got a peek at 3 beautiful deer around the cabin. 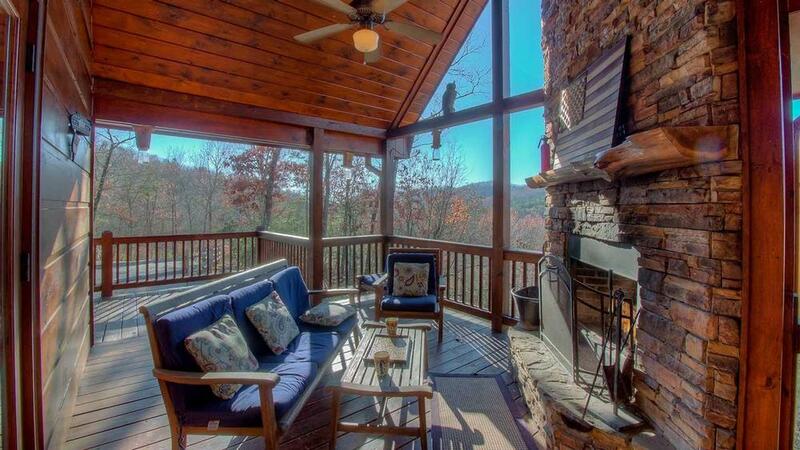 2nd time booking a vacation cabin through Escape to Blue Ridge. Easy process with no complaints at all. 10/18 - I loved that there were plenty of cooking supplies and a number of games to choose from. The sound bar downstairs was an added plus as we were able to listen to music upstairs and downstairs. Overall I enjoyed my stay. 10/18 - We enjoyed the cabin very much. 08/18 - Hot tub, spacious master bedroom and porch. The outdoor fireplace would be wonderful in cooler weather but not so important in August. Everyone I have talked with has been great. 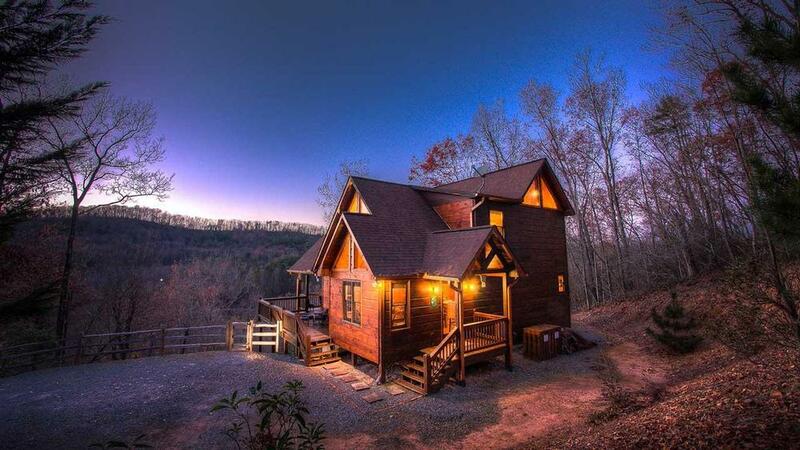 This was our third rental from Escape to Blue Ridge and all cabins have been beautiful. Thanks. 08/18 - Nicely equipped kitchen and very nice hot tub. 08/18 - Quiet location, but close enough to everything. Wish I would have booked the house longer. Easy to book, great communication. 07/18 - It was just like being home. Great views, stocked nicely with everyday things you need. Your company seems very professional and very helpful. 07/18 - Very nice home. Well kept. 06/18 - The cabin was extremely clean and easily accessible. The interior was nicely decorated and comfortable. Excellent views! 10/17- The cabin was nice, clean, and was central to the offerings in the surrounding areas. 08/17- Close to the town of Blue Ridge and Lake Blue Ridge. Thorough and friendly. 08/17- I felt like I was in a family friend's house. I had everything I needed to make our stay comfortable. Your company is professional and communicative. Thank you. 07/17- Our favorite features of the home were the decor and all the wood. You guys are fabulous. 07/17- The back porch/deck area looking out at the mountains was the best. The wood wasn't splintered or noisy while walking on it and it was very well kept up. I spent most of my time out on the porch. Only dealt with the staff twice. Once at booking and then again when the battery in the smoke alarm died and the thing wouldn't stop beeping. Both interactions were great and acceptable. I can only assume from the way the cabin is maintained and what we walked into upon arrival that anyone involved with your company enjoys their work. I stay at lots of hotels and can honestly say, your cabin was cleaner and better smelling than most places I stay. 07/17- Everything with the home and the setting was well described and very accurate. One very rainy day we stayed at the cabin......it did not seem like a wasted day.....it was a very relaxing and tranquil day....just having the beautiful mountain views always right there. Everything was handled in a very professional manner. 04/17- This home was beautiful and so CLEAN!!! The germaphobe in me loves white sheets (that way I can clearly see if there is hair, bed bugs, sketchy mystery stains, etc. ), so I was very pleased that the bedding had white sheets. I loved the art and decor, the views, the hot tub was fantastic too! The hot tub also appeared very clean, no odd chemical smells, clear water, and it was a great size. I also loved that the kitchen had wine glasses in the cabinet, the last cabin I stayed at with a different company did not have those. :) The associate we spoke with over the phone when booking, was so friendly and had so many fantastic suggestions. The home was clean and beautiful. 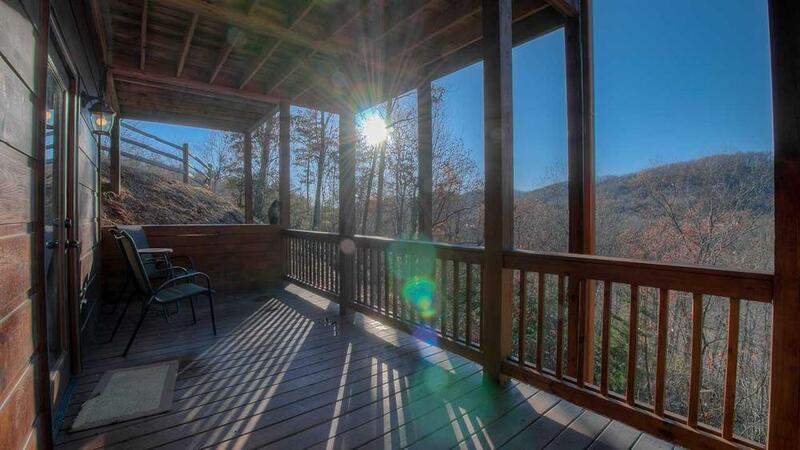 I would trust going back to Escape to Blue Ridge. 04/17- The cabin was very nice and clean. 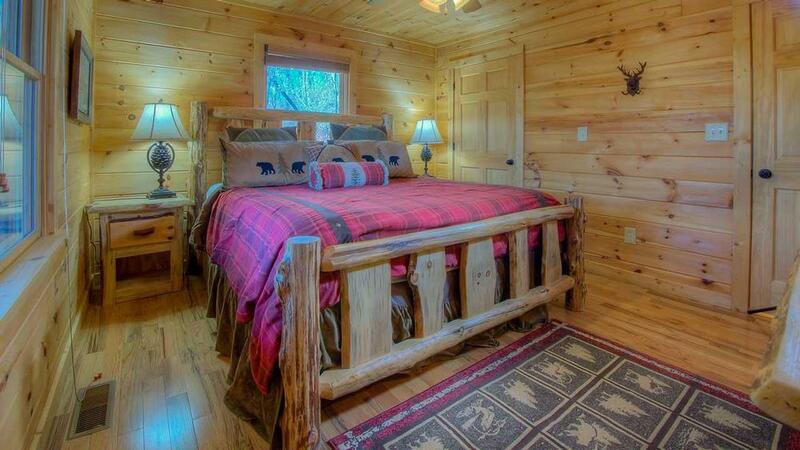 Very cozy and welcoming. Pure class. We have used the company two times and both times have been wonderful. 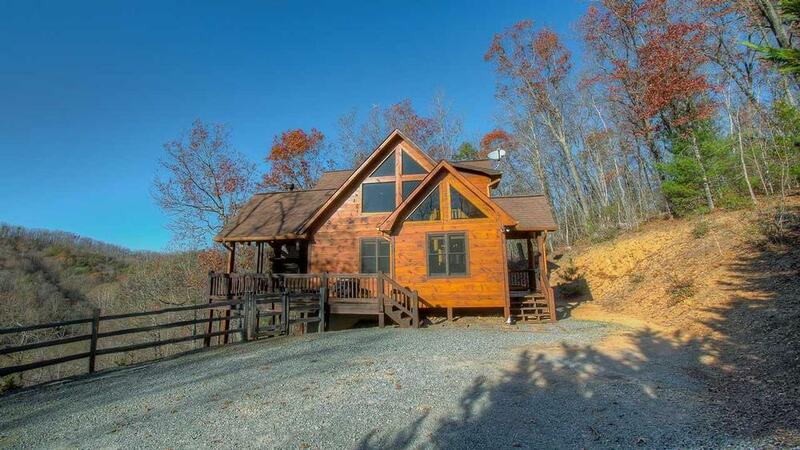 03/17- Proximity to Blue Ridge; nice cabin for three to four people. Your company has been our go to for vacations for several years. We always stay in a different cabin so we can experience different areas of North Georgia. Your staff is always friendly and helpful! We wouldn't work with anyone else!! 03/17- We enjoyed the outside fireplace, access to the cabin was not that bad compared to others. Friendly and helpful staff. 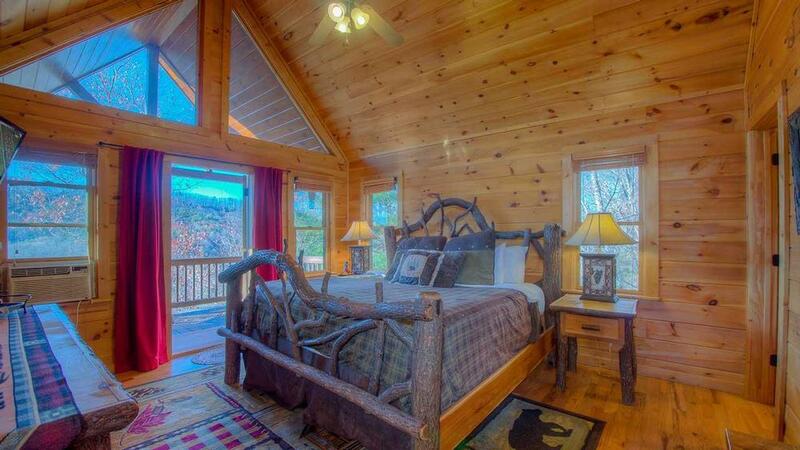 03/17- Our favorite features of the cabin were the deck, hot tub and the comfortable beds. 03/17- Love love love this cabin and how close it was to town. We really enjoyed the outdoor fireplace and pool table. Definitely planning on coming back in the fall! Super nice staff! Look forward to renting again! 01/17- The view was amazing! The hot tub was perfectly positioned. 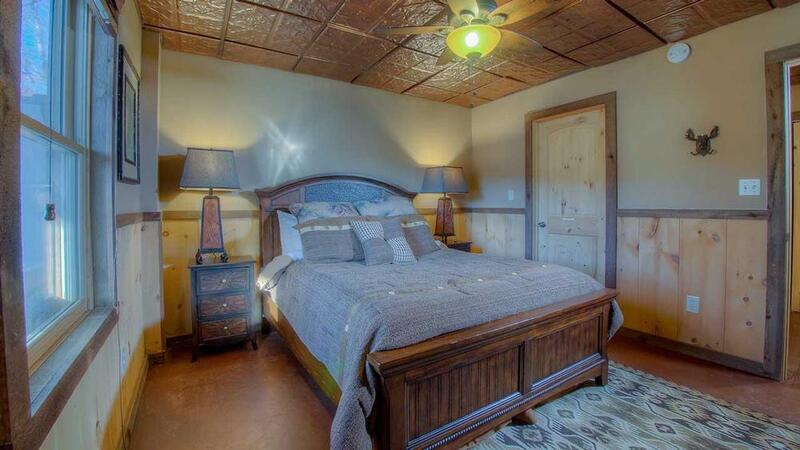 I loved the fact two rooms have king beds! Very professional and helpful staff! 01/17- The home was cozy and the location was great! My family had a great time! Everyone is very friendly and accommodating. This was our 5th year and each time we get a different cabin. I am constantly recommending your company because every cabin is nice and the staff is wonderful. They are there if you need them and not a bother when you don't. I love how responsive they are to voicemail when I have a question. Thank you!! 01/17- I loved everything about this cabin. The location. The views from the balconies. I loved how quiet and peaceful the area was. The company seems to be 100% on top of their properties. 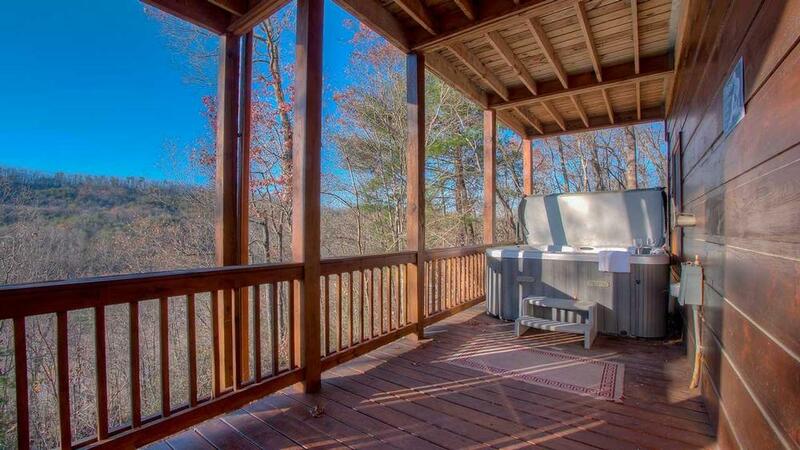 11/16- Love the hot tub, ease of access and beautiful layout. Always professional and easy to deal with. Would not use anyone else! 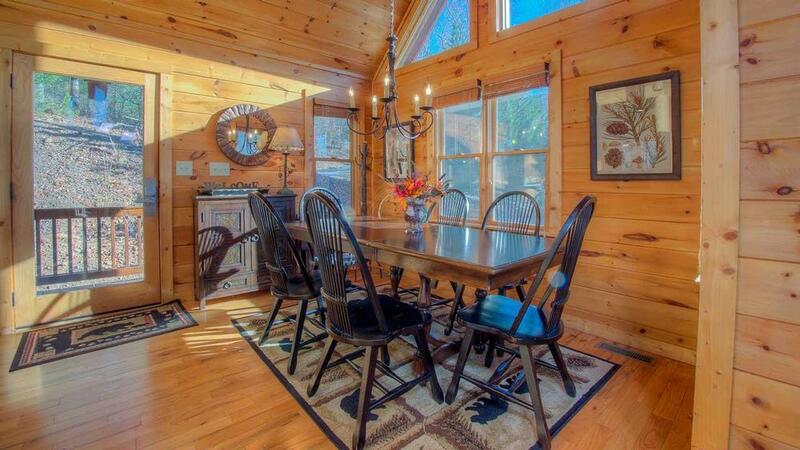 10/16- The beautiful cabin is clean, well maintained, everything that we needed was there. Nice dishes, silverware etc. Towels, rugs, blankets all good quality. All the details were just perfect. We loved the ease of the inside fireplace and the hot tub. The location was great! We really very much enjoyed it and we will be back! Thank you so much! Your company is very easy to correspond with, prompt and friendly. Best company we've dealt with. Thank you! 10/16- Loved the peaceful mountains. 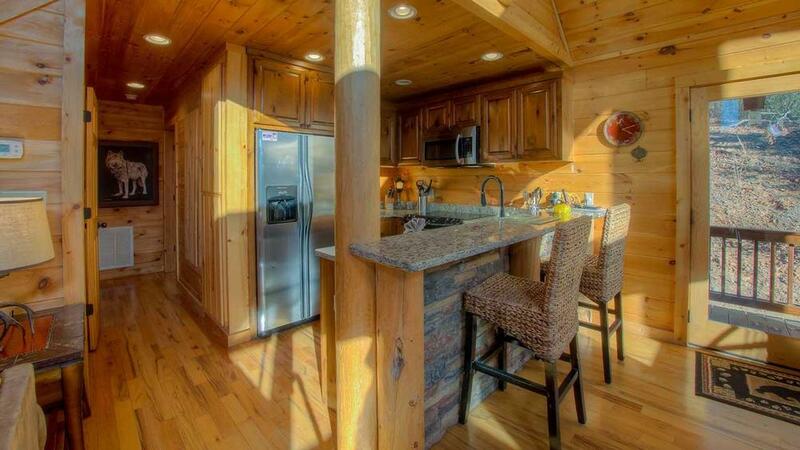 The staff were very helpful in getting our reservations The cabin was fantastic and we had a wonderful vacation. 08/16- We stayed at Buckhead Hideaway for our first ever cousins retreat. We found the cabin to be perfect for our needs. Very clean! The kitchen is very well stocked and all of the furnishing, including the beds were plush and comfortable. Your company was a pleasure to work with. Very informative and helpful and extrememly detailed! Loved the small gift bag as we arrived!! 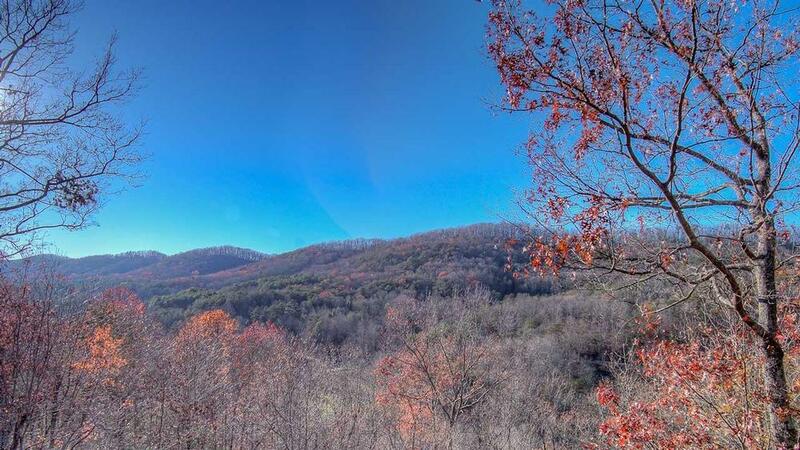 04/16- The location is great..
04/16- Beautiful scenery, close to downtown, comfortable. 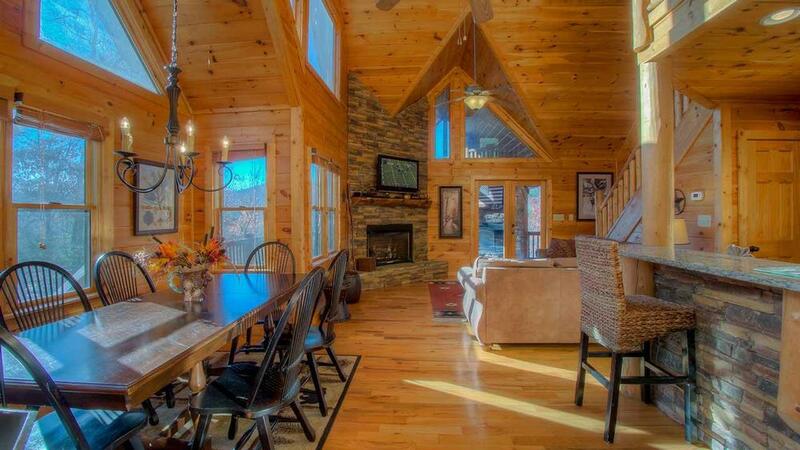 03/16- Beautiful cabin and amenities. 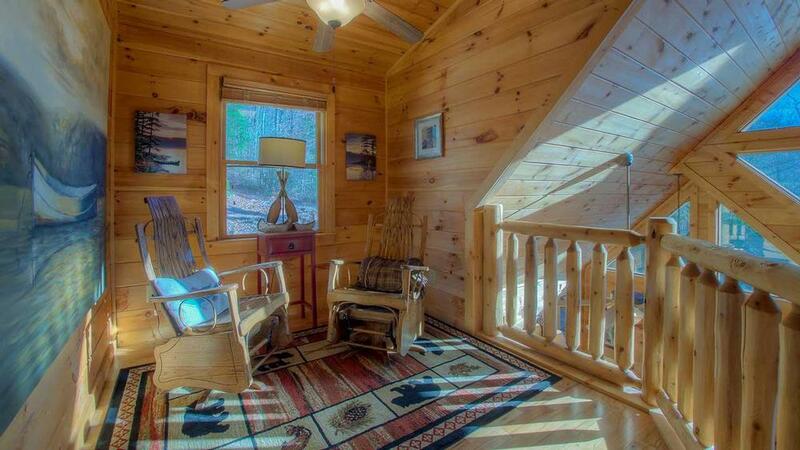 02/16- The cabin was very clean, with updated appliances and comfortable furniture. There was ample space for friends/family. Very helpful and courteous staff. We were always able to reach someone when we needed them, and always received the help we were seeking. 01/16- Everything was great!. I liked the keyless entry system and how it made it so easy for a late check in. The cabin was beautiful and well maintained. We had a great time! Very impressed with the company and the rentals they offer...everything is first class! 01/16- cabin was beautiful! Very relaxing. Not to far up the mountain but still an amazing view! close to all the downtown shops! Any issues we had were taken care of in a timely manner! We will be back! 01/16- The cabin itself was nice. It was certainly lacking Christmas decor as we booked during the Christmas holiday and it didn\'t have the holiday feel. Also, the basement bedroom/playroom was always cold because it had no heat vents. 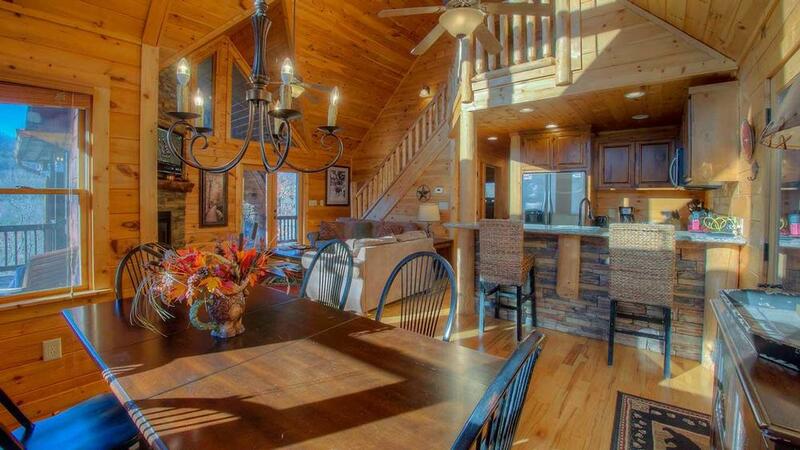 But overall the cabin was ok.
10/15- The cabin was very nicely furnished and very clean. Everything worked except we were not able to get on the Internet. 08/15- Beautiful and clean. An awesome first time experience. Also, the labeling on the light switches was a very useful feature. 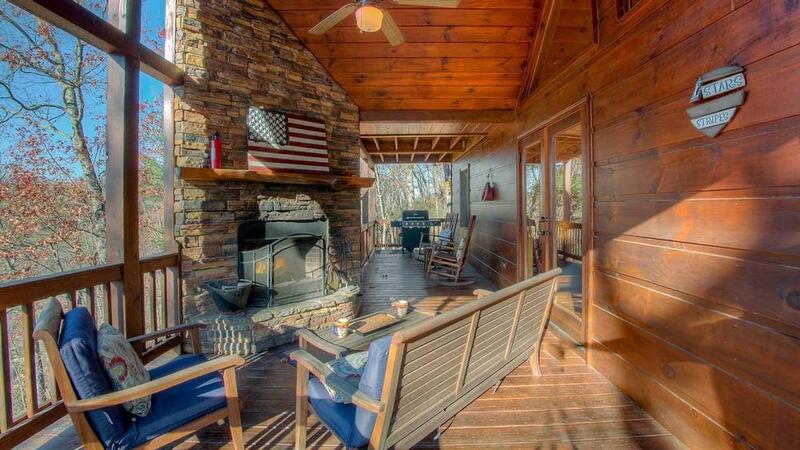 When it comes to cabin rentals, Escape to Blue Ridge, is my first and last resort. 08/15- Very cozy. Great location. Secluded. Your company is top-notch. Every time I called I got a timely answer. The overall renting experience was easy and instructions were precise. 07/15- The whole cabin in general was more than what we expected. The view was superb! 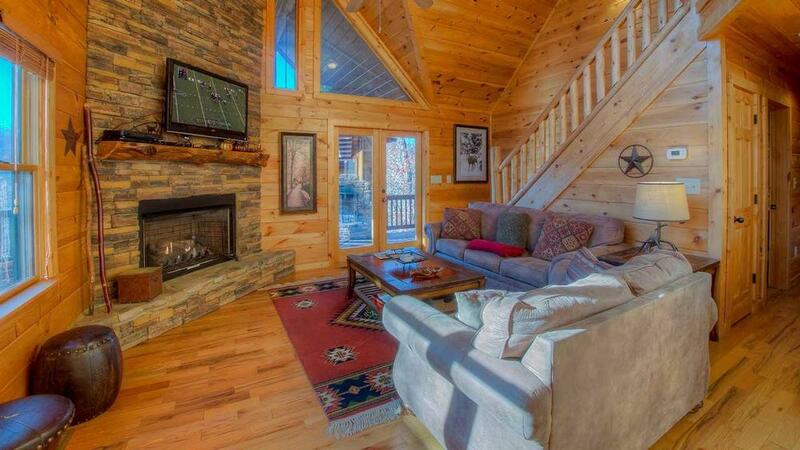 We enjoyed everything the cabin had to offer, from the game room to the Jacuzzi. We used the kitchen every night and with the kitchen supplying all utensils and whatnot, it made cooking for the family exceptionally easy. At first, I was nervous as to what we really paid for when we booked the cabin because you never know. 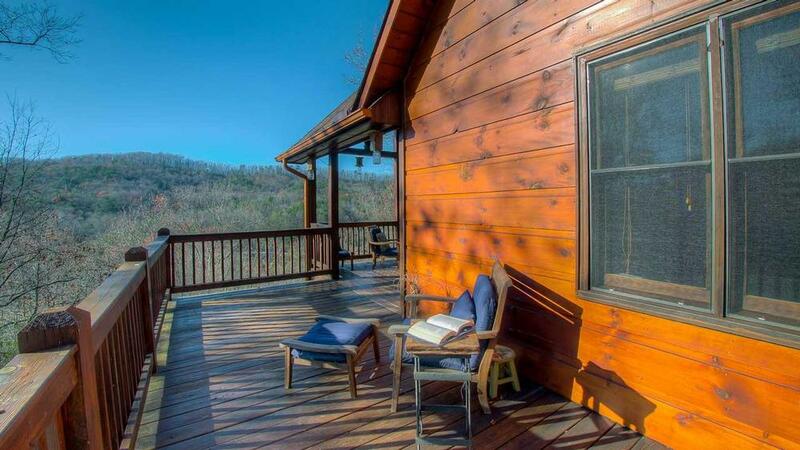 When we arrived at the cabin, it looked exactly like the pictures that are used to promote it. When we walked inside, we were greeted with a little welcome bag with goodies, which my teen loved. I liked the info book that helped us with all our questions. Having a land line made me feel safer along with the pin lock that we could change to our own, this made our visit feel more homely and safe. The location of the cabin was perfect(Walmart was our spot in need), we were within at least 20mins of all of the adventures we booked, if we drove further it didn't matter because we just enjoyed the scenic view! I was very pleased with the amount of information and email correspondence that we received. Not once did I need to contact or feel like I might be missing something. Your company was on point! We also enjoyed the little guest books on the coffee table! Super cute!! In all, no complaints! We will for sure be back as much as we can and we will recommend your company to all our family and friends! 07/15- Very upscale dÌÄå©cor. Loved the gas fireplace. The fireplace on the patio was a welcome site as well. Interior and exterior of the home was very well cared for. 06/15- The peace. I honestly enjoyed the "outdoors"! Being that's it's so far away from the city, the star gaze is phenomenon! !! 05/15- The house was exactly as described, and as the pictures showed it to be. 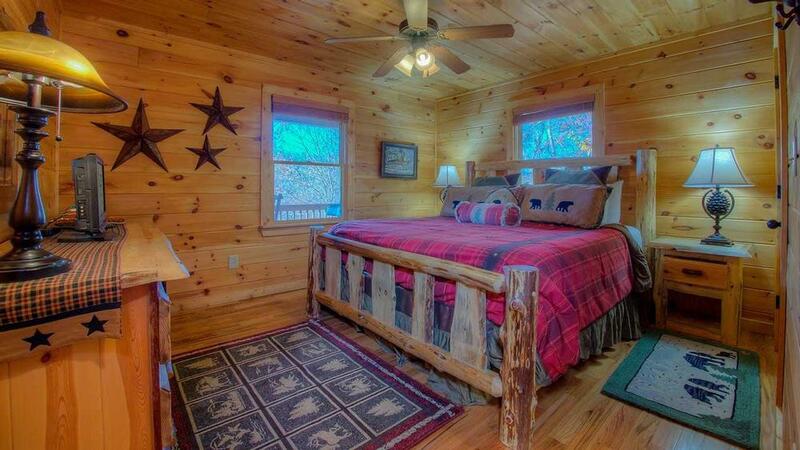 The beds and furniture were so comfortable, and the location was perfect in respect to town and other cabins. Every person I dealt with was friendly, and answered every question we had. They made the rental process very efficient and easy. 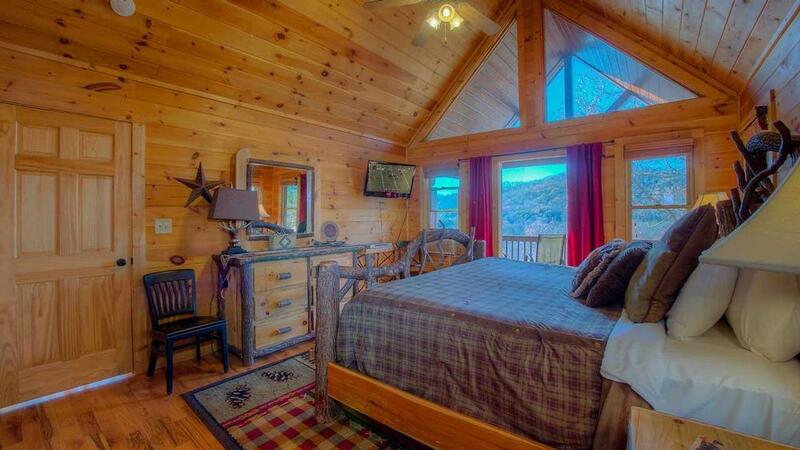 I prefer this style of cabin rental and will definitely recommend and use your company again. 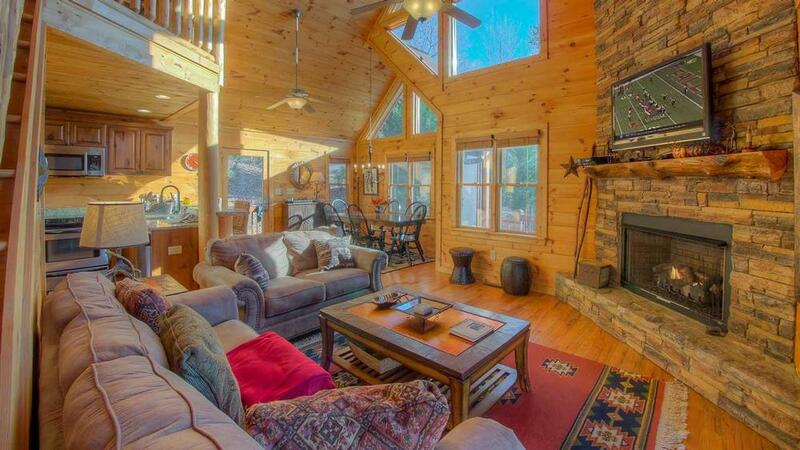 03/15- The cabin was modern, not too cluttered, wi-fi, the entertainment room, the porches were very nice. The staff was always friendly!!!! That was a big plus because great customer service is hard to come by these days. We called in that the light bulb had blown (just to let them know) and that we noticed that the kitchen sink had a small leak, literally with in minutes they had maintenance there to check these issues out. This was great it assured us that if there was a serious problem that they would be on it quick!!! 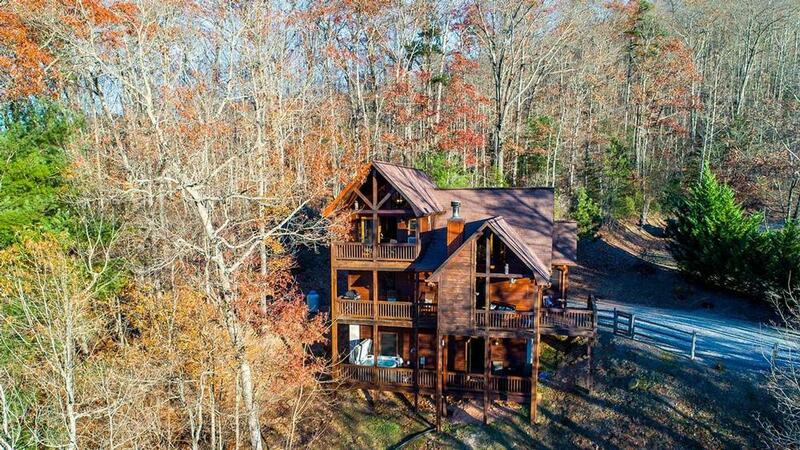 Over all loved the cabin!!! 01/15- Outside terrace with fire pit and rocking chairs. The cabin was also easily accessible via car. 11/14- The secluded feeling you got being in the cabin, yet just 15 minutes from town. Loved the views, the woodwork. Overall an extremely comfortable and relaxing place to stay. 11/14- This Cabin was great my family enjoy both fire places and hot tub. We enjoy TV above indoor Fire place. Felt like home to us. 11/14- the home was lovely and perfect for me and my husband. 10/14- I love the outside wood burning fireplace, the wonderfully equipped kitchen, the lush towels LOVE this company! The customer service is wonderful! 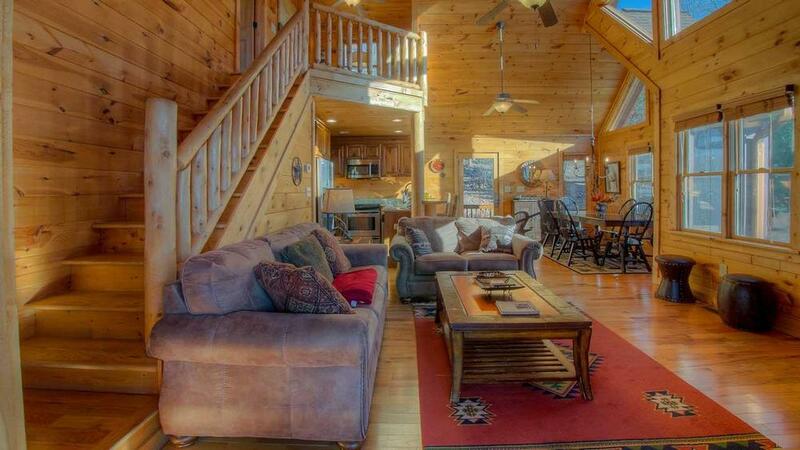 LOVE these cabins! My only complaint is the advertised nightly rate gives the impression of a really affordable get away. However, when you add all the "extra" charges it isn't as affordable as you first think. 08/14- great location - convenient to a lot of the activities we participated in. 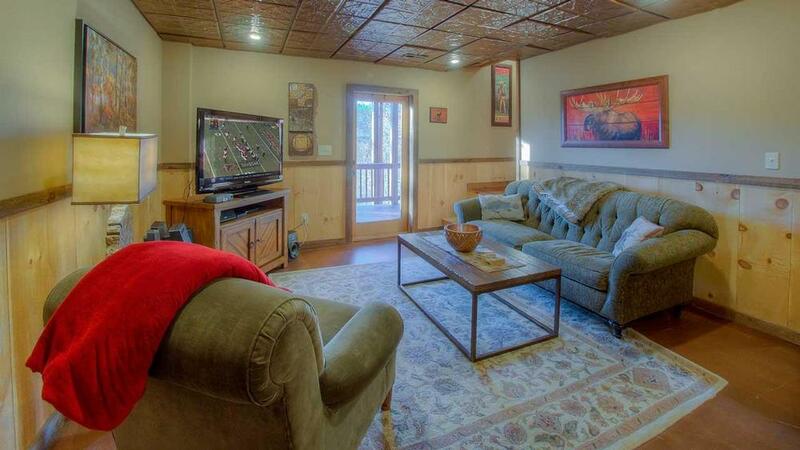 great layout for a family of 4. game room was fun too. 07/14- Loved whole house but especially the outdoor wood-burning fireplace. Flat screen tvs. Especially in basement. 07/14- Loved the outside porch and downstairs game room. Can't wait to come back to Buckhead! We really liked the cabin location and layout. But tv did not work the entire trip. While we didn't come here to watch tv, it would have been nice to get kids cartoons while we got dressed or watch some before bed. ( Management has fixed TV) But, Jacuzzi was great, view was amazing, and it was peaceful. Staff is friendly and does spend time to help guest find right cabin. Nice extras to help with trip. Overall, thanks again and we would definitely return! We stayed at the Buckhead Hideaway from June 30-July 3 and this was nothing but a disappointment as we just got married on June 28 and were looking to enjoy our honeymoon. However, nothing seemed to work in the Buckhead Hideaway even after we called Customer Service to have them come fix the issues. The hot tub never got above 75 degrees, the cable kept cutting out and had to restart every 15 minutes and the Wi-fi was broken due to the wireless router so we could never review any places to visit or eat at since we had no signal on our mobile devices. We were excited when we first walked into the cabin since the house was clean and comfortable, but we were turned away when none of the stuff worked. We would love to go back and visit if everything was fixed and working but we don\'t know if that will happen. This cabin was awesome and offered everything we could possibly need, it was very well equipped and clean. We loved all the beautiful decorations. 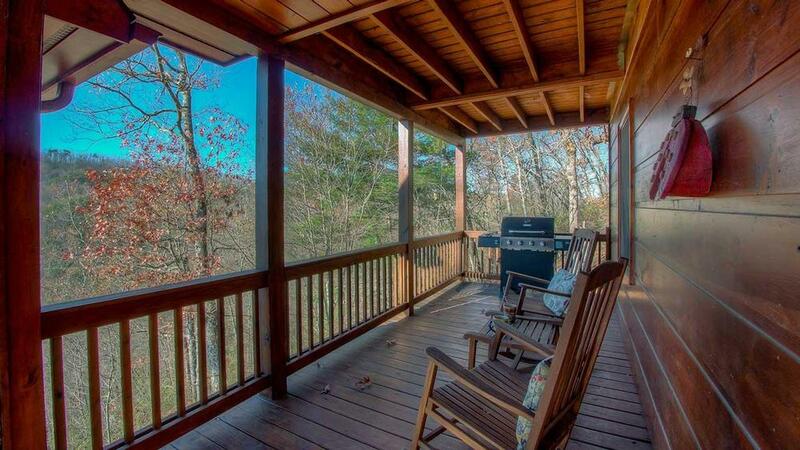 We spent most of the time on the porch, grilling or in the hot tube and enjoyed the outside fireplace at night. We enjoyed the privacy and picked blackberries just outside the back door.